Mothers’ Union has been alive in Harting for at least 80 years. We are a small group of 9 at present, of mixed ages, meeting usually about once a month, in the evening or at weekends, often in a Member’s home for “nattering, knitting” - which includes work making tiny garments for neo-natal hospital units - “and nourishment” - which includes prayer as well as simple refreshments. In the village, Members help with events such as Pre-School Praise, and in the past have organised several Parenting Groups for parents of children of all the different age groups – and we can do that again if demand is there. Our aim is to do all in our power to help families and children in all aspects of life. Our meetings are open to all, and advertised on our Noticeboard in Church. 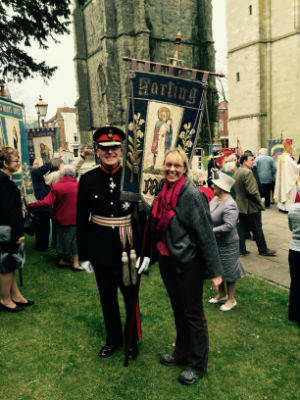 MU is part of a World-wide organisation of 4 million members, and our own Members play their part in events in our District and Diocese of Chichester. As a Registered Charity, any fundraising we do is for MU and its work, at home and abroad. Our meetings are open and we are always ready to tell about MU and its aims. You do not have to be a mother, or married, or even a woman! This is a weekly gathering, in term time, for 0-5 year olds with their mothers/fathers/carers. It takes place in the Law Room (Church Annexe) on Tuesday mornings from 10.00-11.30 am, offering stories, music, toys and refreshments in an atmosphere of welcoming and relaxed fellowship. For further details please contact Patricia Grigsby on 825295 - or just turn up. You would be very welcome - no charge is made.